The Objectives and Key Results methodology and framework allows for a lot of customization. But when you are just getting started with a new goal-setting format it is better to have more clarity than the freedom that OKR kindly provides. This article gives you a concise overview of what to keep in mind when setting up OKRs with your team. These top 10 questions are picked from the most common questions we, here at Weekdone (the world-leading OKR tool), have been asked by hundreds of team leaders and managers. The answers are aimed to give you at least a few starting points and practical examples. When first starting OKR methodology Shawn, CEO of deverus, points out that the process of adapting OKRs can be difficult. For example, deverus moved their goal planning from yearly to quarterly OKRs and that required more disciplined thinking. “It is hard, because you are asking somebody to clearly define what they are going to do and how to get it done” said Shawn. He also said “I believe that showing the lead as a CEO is very important”. He thinks switching to a new system is easier if the leader believes in it, manages it, and embraces it. “And thanks to Weekdone everybody else can see what I do and that has made an impact” said Shawn. In addition, I recommend searching for your most urgent questions in the table of contents below. Remember, if Shawn can do it, you can too. Let's get started. 1. What are the key benefits of OKR? 2. 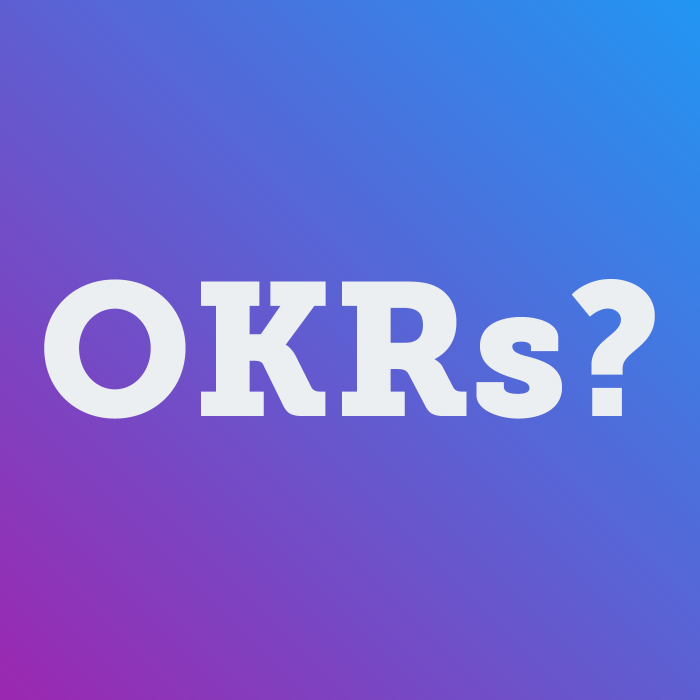 When should I start using OKRs? 4. How to get the team on board? 5. Should I set OKRs from top to bottom or vice a versa? 6. How can I structure OKRs to make them achievable? 7. Where can I find examples of OKRs? 8. KPIs vs KRs? What is the difference? How do they intertwine? 9. What tool should I start using for OKRs? Spreadsheets vs. online automatic OKR software? 10. Who should input and update the objectives in the tool? Research shows we are 42% more likely to achieve our goals when we keep a written record to track and measure success. Therefore, with the OKR framework you are already 42% more likely to succeed. In other words, its main goal is to connect company, team, and personal objectives to measurable results, making people move together in right direction. It's easy to forget that employees, doing their day to day jobs, don't always have access to this big picture. The benefits of OKR methodology is just that: to make sure everyone knows what they are doing and why. One surprising aspect of OKRs is that they suit everyone, regardless of the industry or size. Each team can find an optimal way for implementation. “It makes it easier to align what every individual of the company wants to achieve each quarter” said Lyle Stevens, CEO of Mavrck. It's said if you're looking to implement just one best practice management tool in your team or company, Objectives and Key Results should be it. Whenever you want your people to move in right direction, implement OKR, or have the employees follow your vision, OKR methodology is a great choice. In terms of actually implementing the framework we recommend using them quarterly. It can also be used yearly or monthly if necessary. I suggest you start by setting objectives 2-4 weeks before the next quarter, so that you will have enough time to discuss and set objectives with your team. The magic of OKR is actually the goal-setting process itself. After setting your OKRs you execute the plan and measure your progress. Or as Shawn from deverus said: “The whole process has really helped people understand our, and their, expectations and what they need to do to be successful”. Determine the primary factor driving your company/team right now. Got it? 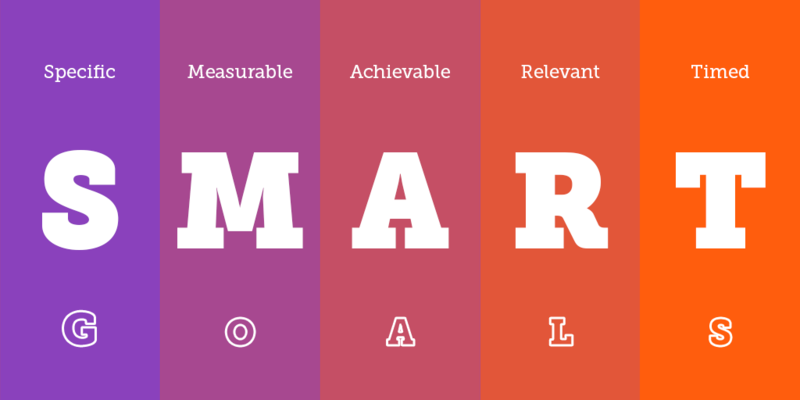 Now, establish 1-3 key results that will measure your ability to reach that objective. The key results are often numerical. They can be based on growth, performance, revenue, or engagement. See the examples below to get a clearer understanding, or visit this page for even more OKR examples categorized by different teams. Once you have completed drafting the first objective, add 1-2 objectives more. Just as a reminder, at first it is smart not to start with too many objectives. Finally, now that you have run through the OKR process, it is time to repeat the process company/team wide. But before you do that, see the next question. In case you want more information on starting with OKRs, I urge you to read this Introduction to OKRs blog post and infographic. In addition, we recommend reading the step by step guide to OKRs e-book with examples and templates. Explain the benefits of OKRs to the team and how it will make their life easier. OKRs are designed so that everybody in the team will have a clear understanding of the big picture and knows what the indicators of success are. Who doesn’t want to have more clarity in their life? 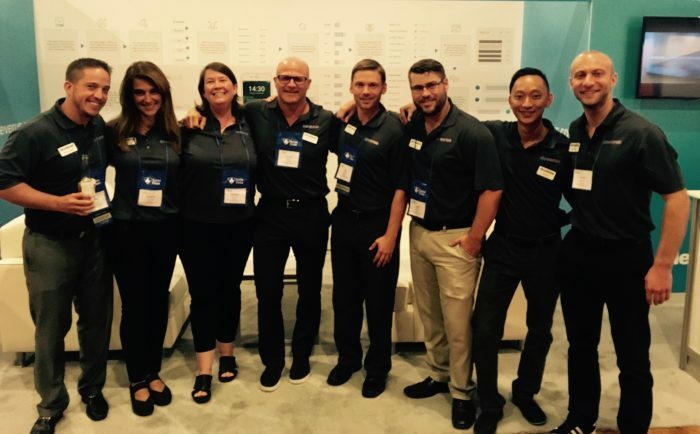 “The whole process has really helped people understand our, and their, expectations and what they need to do to be successful” said Shawn Rucks – CEO at deverus. When everyone knows how their work matters, it is bound to increase overall engagement, motivation, and determination. Increase productivity by focusing on the right goals that are aligned with the overall business goals. It keeps the vision and goals in front of you at all times. Get praise and know what others are doing. By listing your quarterly or monthly goals and key results, everybody knows what you are focusing on and therefore don't have to report as much. Also, it is easier to give feedback when everybody knows what you are up to. Clarity of what is expected from you and defined key results by which your success is measured. You can do both – and many do. There is no wrong or right way. In some cases top management or CEOs outline the company OKRs first and then add them to an OKR tool, asking the team managers to set their team goals based on that. Followed by personal employee goals based on team ones. For example, our CEO has given us a general direction for what we would like to focus on this quarter. After that, the team managers alongside our teams propose our OKRs to fulfill the overall company goal. Actually, the moment I am writing this article, our company objective is “Be the best OKR software: including product, marketing, and sales”. Now, all the teams align accordingly and propose 2-3 objectives with 3-4 key results each. As a team manager, I ask my team members to propose their activities for this quarter considering the overall theme of being the best OKR software out there. On the basis of my teams proposition I form our marketing team OKRs and after that we go over these with our CEO. This process is repeated throughout the company with other teams. This way every person has a say in it and we are all invested in achieving our goals. It is an amazing sight when everybody is working towards a common goal. You start to see the power of unity, making the work more efficient and less time consuming. In a way, this process consists both ways – top to bottom and vice versa. In other cases all employees are asked to come up with suggestions for their next quarter's activities. In both cases you come together on a team level to iterate on them, add, delete, or modify some of them. That is the process of setting and aligning goals. More info on how to set and align team goals can be found here – Hierarchical OKRs. The OKR framework has achievement written into it. On one hand you are stating what you want to accomplish and on the other hand you have key results that indicate whether you are successful or not. Here are few tips to make sure your OKRs are well structured and achievable. Now that you have finished setting OKRs at the company and team level, repeat the process company-wide. When setting each individual OKRs, remember not to have the same objectives as on the company level. Personal level objectives have to support the top level goals. 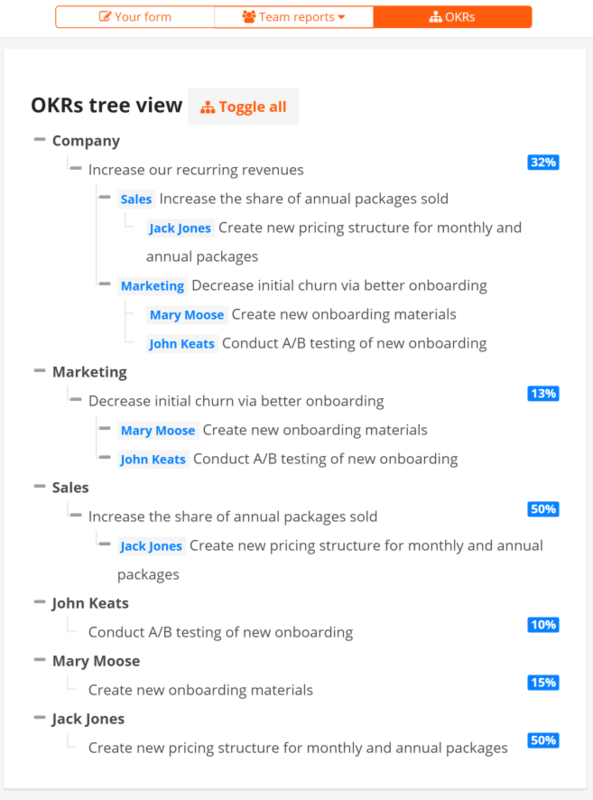 See the example OKR hierarchy view. So far we have been very practical, but we have to remember that one part of the OKRs are that they are meant to be ambitious, hard to reach objectives. Therefore, don't forget to add some aspirational goals that you might only achieve 50-70%. So, start with the most critical objective and add some aspirational goals. That way you make sure that your company/team is evolving. As described in the previous points, make sure your OKR setting process is collaborative and everybody has the chance to participate. Then everybody has buy-in and the objectives are more likely to be achieved. The final and the most important part of achieving your objectives is having managers and employees check in once or twice a week. During 1-1's it is essential to spot potential roadblocks and monitoring the progress made. This also avoids potential bottlenecks and injects a feeling of unity. Getting started with OKRs can be confusing, but it doesn't have to be. You don't have to invent the wheel. Of course, we suggest setting your own objectives, because in a way every team and company is unique. Nevertheless, it is always good to see how everybody else are doing their OKRs and learn from them. 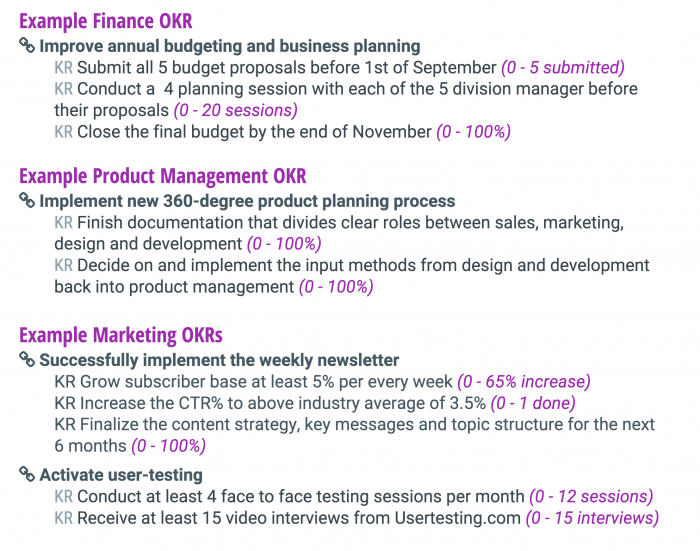 For that purpose we have a special page that has OKR examples for different teams: Marketing, Sales, Finance/Accounting, Product Management, HR, Customer Service, Engineering and more. Feel free to copy and improve. Chances are that in some point of your life you have used some kind of Key Performance Indicators. Now, with OKRs we have Key Results and that can be confusing. Don't worry they are almost exactly the same thing. So, if you have used KPI's you already have a upper hand in using key results. People use both. Spreadsheets can be used very successfully, but you have to update it manually and there is a high chance that people won't use it. A lot of our customers have turned to Weekdone with the same problem. Lyle – CEO of Mavrck said: “The central problems with spreadsheets were that it was a time consuming process that was difficult to manage and keep track of. 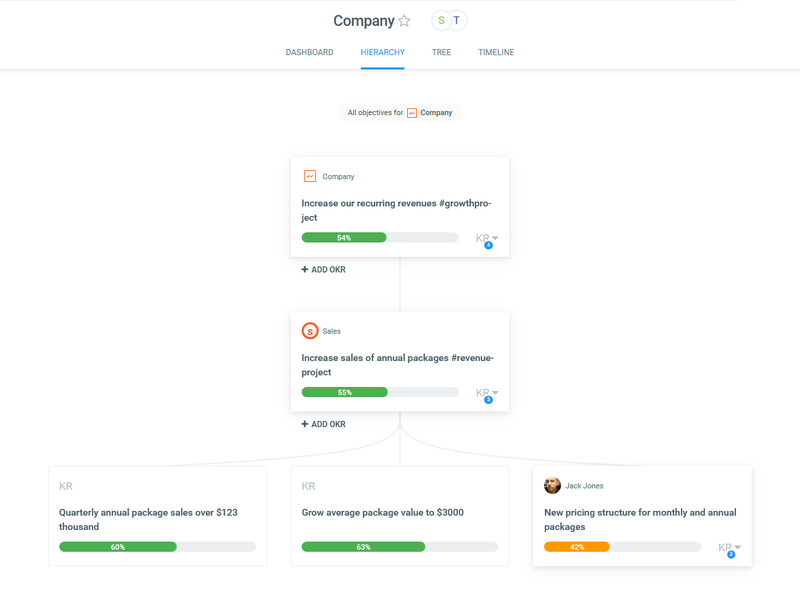 We stopped using it as often as I would've liked” See how Mavrck moved from spreadsheets to an automatic OKR tool. Nevertheless, if you want to try out the spreadsheet goal-setting, use the OKR example spreadsheet to get started. If you want a guide to transition from spreadsheets to automatic OKRs, check out this guide. When you start using OKR software or spreadsheets for OKRs a common question arises: who should put in the OKRs? OKRs should be empowering and bring clarity to an organization. Therefore, objectives and key results should be put in the tool in a hierarchical way. The CEO should put in company objectives, team managers should put in team goals, and individuals should put in their own. For individual goals, team manager should make sure individuals have all the necessary information to put into their OKRs. The same principle applies even when updating your OKRs. Everyone should update their own OKRs and everyone should have visibility rights for the whole company. This way the OKRs are transparent and everybody is involved, which makes the whole process more likely to succeed. 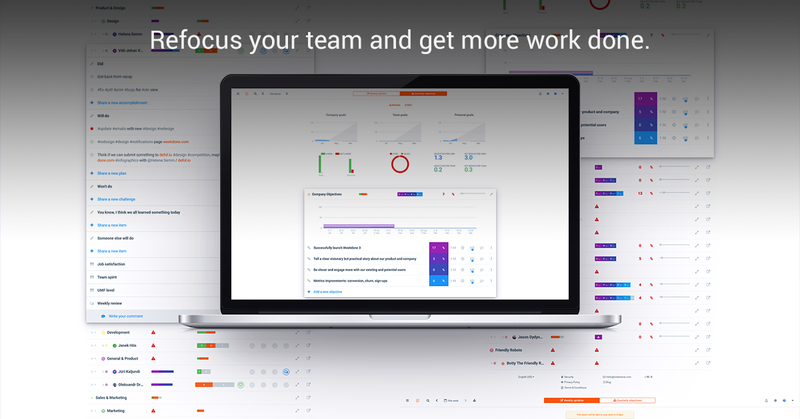 To try out the world-leading Weekdone OKR software, sign up for free here. Remember to follow us on Twitter, Google+ and Facebook for all about management, okr, okrs and more!